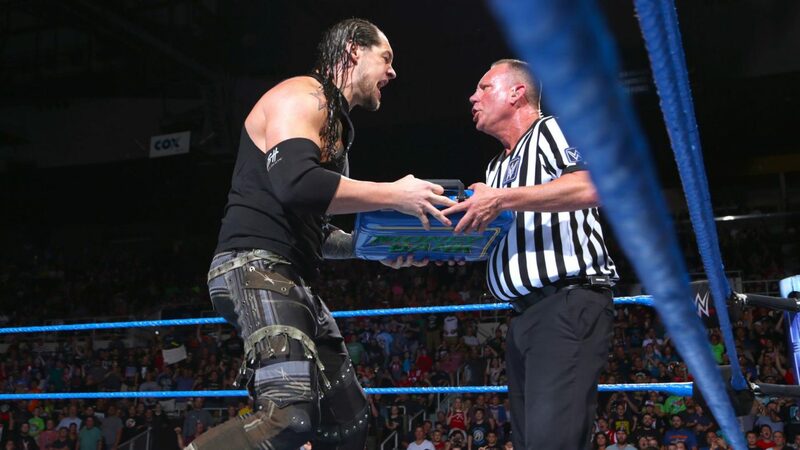 Baron Corbin cashed in his Money in the Bank Briefcase – and lost – AiPT! Just the second man in history to lose his cash-in match. The main event match of tonight’s episode of SmackDown Live from Providence, Rhode Island was an impromptu one, as Baron Corbin cashed in his Money in the Bank briefcase against Jinder Mahal in an attempt to wrest control of the WWE Championship after Jinder was laid out from an avalanche Attitude Adjustment at the hands of John Cena. And for just the second time in WWE history, the man who cashed in the Money in the Bank briefcase lost the match. Too distracted by John Cena’s presence to capitalize on the opportunity, an opportunistic Jinder Mahal rolled him up in a school boy for the 3 count in quick fashion. Corbin then went absolutely ballistic, realizing the gravity of the enormous blunder he just committed. Corbin joins Damien Sandow as the only two men to have lost their cash-in match (John Cena unsuccessfully challenged for the WWE Championship when he cashed in against CM Punk in 2012, but he technically won the match via DQ). Is this part of a storyline to propel Corbin’s anger to new heights? Or is he in the doghouse? Hopefully SummerSlam will have some answers, as Corbin squares off against the man who inadvertently cost him the championship, John Cena.